If you're not a fan of the shorter scale length usually found on LP-style guitars, then the Super Swede EMG should be on your must-try list. Ideal for heavy players and those after darker sounds. Untidy wiring makes battery replacement difficult. Over 40 years since its introduction, the Super Swede is still the flagship model of Swedish (of course) maker Hagstrom. The Super Swede EMG is the most recent addition to the line and represents a modern take on the range's more vintage-inspired models, most notably through the addition of active pickups and a kill switch. The Super Swede's influence is obvious, so as you'd expect, it has a mahogany body, maple top and set mahogany neck. However, unusually for an LP-influenced guitar, it's packing a Fender-y scale length. Still, the 648mm (25.5- inch) scale is useful for low-end metal: the longer the scale length, the better a guitar performs in lower tunings. 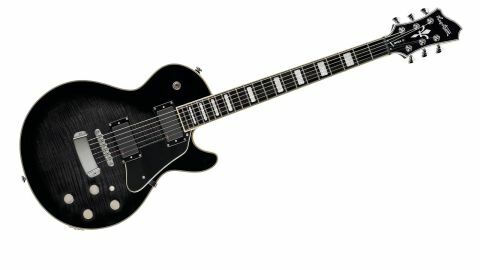 "The Super Swede reveals its character to be as dark as Darth Vader in a particularly bad mood"
The neck itself is a comfortable, generic C shape, and what looks like a dark ebony fretboard is actually a composite material that Hagstrom calls 'Resinator' wood. Lauded for eliminating dead spots, it looks and sounds pretty much the same as ebony. The fretwork is very good, and since it's accompanied by a flatter 381mm (15-inch) radius, you can achieve a fairly low action without excessive buzz or choking. Our only quibble with the build quality concerns the untidy wiring compartment which, in order not to disturb the pickup wiring, required some rock-steady hands when replacing the battery for the active pickups. The appearance of EMGs often gives a clue as to a guitar's target audience, but in spite of their high output, these pickups usually allow a guitar's sonic identity to show through, and the Super Swede reveals its character to be as dark as Darth Vader in a particularly bad mood. In fact, it was so dark it was often tricky to distinguish between the neck and bridge pickups. A/B'd with a PRS S2 Singlecut loaded with a Seymour Duncan JB and '59, the Hagstrom lacked the mid and treble bite of the PRS, but instead offered a scooped mid sound, ideally suited to old-school metal riffs. It's a very distinguishable sound that would doubtless appeal to a lot of heavier players, especially those who aren't fans of the mid-rich tones usually produced by a mahogany/ maple single-cut. There are coil-splits for both pickups, too, and although they're usable, we found that the split bridge gave a very thin and weedy tone, whereas the split neck offered a more balanced sound that - on a clean setting - was preferable to the bass-heavy neck pickup without the split engaged. It lacks the snarl of a typical souped-up single-cut, but it does come with a mid-scooped metal tone on tap, which will appeal to anyone dabbling in the darker musical arts.